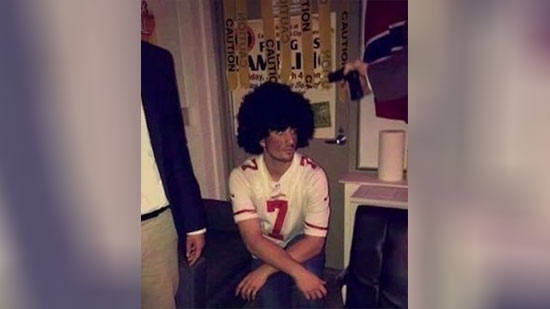 A photo has surfaced from a Halloween party of a student at a Pennsylvania college dressed as former San Francisco 49ers quarterback Colin Kaepernick with someone else pointing a gun at his head. Officials at Dickinson College in Carlisle, PA are investigating the incident. In a message over the weekend, Vice President and Dean of Student Life Joyce Bylander called the costume "deeply offensive" and "distasteful" and referred to the actions of the students as "very poor judgment." She did however say it was free expression, but that the community should "answer speech with speech." Other members of the community have expressed concern that the message was a death threat and not free speech. The school is investigating the gun in the photo. Guns, real or fake, are prohibited on campus. Read the full message from Vice President and Dean of Student Life Joyce Bylander here. A New Jersey man is under arrest for stabbing his roommate while he was in the shower. It happened on Sunday morning in Burlington County. 34-year-old William Hines and his 54-year-old roommate had an argument. The roommate then went to take a shower. Hines entered the bathroom and stabbed him multiple times in the face, upper chest, hands and arms. The roommate is in critical condition at Cooper University Hospital. Hines fled the scene but turned himself in to Burlington Township police on Monday. He is charged with criminal attempted homicide, aggravated assault and related charges. He is being held at the Burlington County Jail. Three people were injured, 2 children and 1 adult, in a fire in Philadelphia's Juniata section early Tuesday morning. It happened around 3:30 a.m. on the 3800 block of Bennington Street. Firefighters arrived to find thick smoke coming from the row home. They were able to quickly put out the fire. The three injured were taken to the hospital in stable condition to be treated for smoke inhalation. No word on what caused the fire. The Philadelphia Eagles have acquired RB Jay Ajayi from the Miami Dolphins for a 2018 4th round draft pick. The NFL trade deadline is today at 4 pm. This year Ajayi has rushed 138 times for 465 yards. He had a big year in 2016 rushing 1,272 yards for 8 TD's and making the Pro Bowl. The Eagles have been looking for another running back after losing Darren Sproles to injury early in the year. Ajayi was born in London, England. He attended Boise State and was drafted in the 5th Round by Miami in 2015.